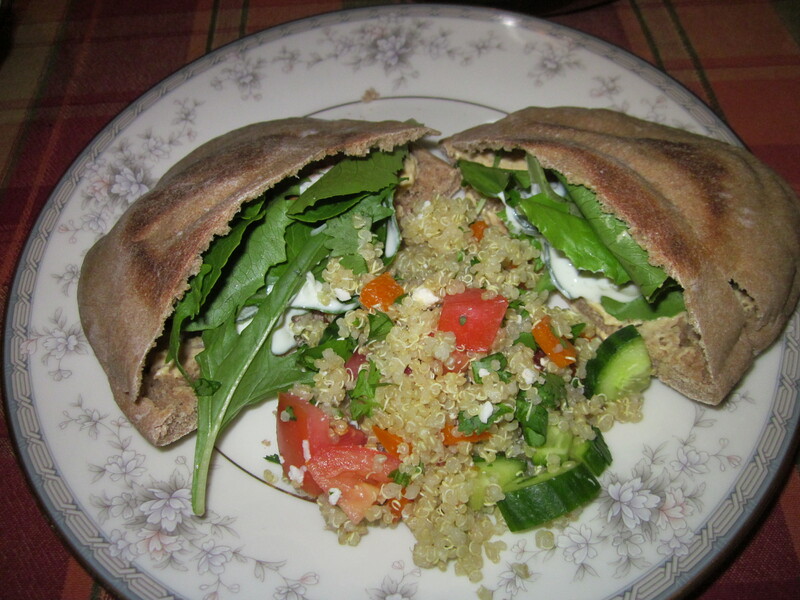 This week, I did manage to make homemade pita bread, using a ubiquitous online recipe. More time-intensive then I expected… even though they only take about 6-7 minutes to bake, with six batches it quickly adds up, and unlike a standard loaf of bread, it takes your active participation throughout the baking process to roll out, flip, deflate, repeat. Worth it, though! I was pretty pleased with how they turned out, though not all of them puffed fully. Even if a few don’t form a decent pocket, you can still top them or cut them into wedges and dip them in hummus! The first few were a bit undercooked and ended up a somewhat gummy after steaming in the bag with a growing pile of hot pitas. I may try increasing the temperature to 500ºF next time, or add another minute of baking. You may find you need to tweak the recipe some for your oven as well. The dough was easy and pleasant to work, and rolled out quite easily. I highly recommend rolling them out on a lightly floured piece of parchment paper, which makes it simple to transfer them onto the baking sheet. The baked felafel were a breeze to make and pretty darn delicious! Thanks Ellie Krieger, from Food Network, for the guidance! Of course, I couldn’t help playing with the recipe a little. I wish I had made more! Perfect with a little hummus, lettuce, tomato, and a variation on tabbouleh. Dissolve yeast and honey in warm water. Let sit for 10-15 minutes, until water is frothy. Meanwhile combine flours and salt in a large bowl. Make a small “well” and pour water in gradually, stirring until elastic. Knead dough about 10-15 minutes, until smooth and elastic. Grease a large bowl with oil and turn dough to coat it. Cover and let rise in a warm place for 1-3 hours, or until it has doubled in size (it took only a little over an hour for me). Preheat the oven and a double layer of ungreased baking sheets to 475ºF. On a floured surface, deflate the dough and divide it into 12 pieces. It may help to divide it in four, then roll each into a rope and cut into three sections. Form each into a ball, and let rest on the counter, covered, for 10 minutes. Roll each ball out to 5-6 inches across and 1/4 inch thick. (I rolled them two at a time, just before placing them on the sheet and baking the batch.) You don’t want them thinner or much thicker or they won’t puff up. Also, try to avoid pinching the edges of the dough, as this can also interfere with puffing. Place two pitas on the double layer of baking sheets and bake on the bottom rack of the oven for 5-6 minutes, or until they puff up. Then quickly turn them over and bake them for 1-2 minutes more. It may take a little tweaking to adjust to your oven. Gently push the puff down and place them immediately in a paper bag. 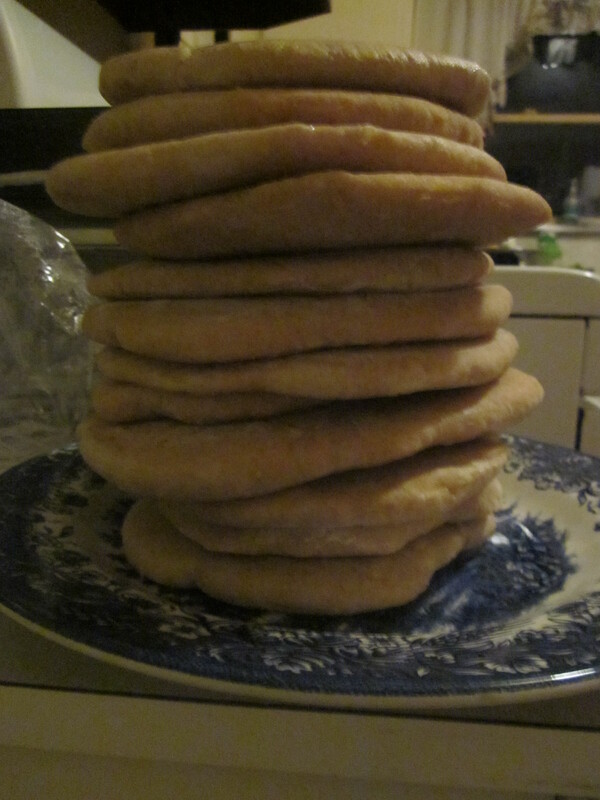 They may also deflate on their own accord as they cool and other pitas are piled on top of them. Let the oven reheat again for a few minutes between batches as the high temperature is crucial for them to puff up. I found this fit naturally with rolling out the next batch of pitas. Slice them in half, stuff them, and enjoy within the next day or two. They do not keep long, but can be frozen for later. Preheat oven to 375ºF. Mash chickpeas with 1 tablespoon olive oil and the seasonings until well blended. (A potato masher makes quick work of this, but a fork can work in a pinch. For larger batches, a food processor might come in handy.) Form into balls or discs and brush with the remaining tablespoon of oil. Bake for 20 minutes on a greased baking sheet, then flip them over and bake for another 20 minutes, until browned and crispy. Enjoy! Stir olive oil and lemon juice into yogurt, then mix in cucumber and season to taste. Garnish with a slice of cucumber if desired. Best served chilled. If any is left over, makes a great dip for crackers! This entry was posted in Breads and Baked Goods, Casseroles and Baked Dishes, Sauces, Condiments, and Dips, Vegan and tagged Cilantro, Cucumbers, Garbanzos, Lemons, Parsley, Whole Wheat, Yogurt. Bookmark the permalink.